I know, I know…I already hear you say….this one goes to the hips!! Once in a while on a lazy Sunday morning cook someone special in your life this tasty brunch recipe. I promise you’ll try it more than once…. It’s ‘berry’ delicious…!! To prepare the red berry sauce: Combine all the berries and sugar in a blender and puree until smooth. Strain the berry puree through a fine sieve, discarding the seeds, and into a small saucepan. Place the saucepan over medium-low heat and simmer for 2 minutes, stirring frequently. Remove from the heat and keep warm while preparing the French toast. To prepare the French toast: Using a fork, beat the eggs in a 13×9 baking dish to blend. Place the slices of brioche in the eggs and let stand for 5 minutes, or until the eggs are absorbed, turning the brioche slices once. Melt the butter on a heavy large griddle pan over medium heat. Add the brioche slices to the hot pan and cook for about 2 minutes per side, or until golden brown on the outside and heated through. Meanwhile, stir the sugar and cinnamon on a large plate; set aside. Immediately place the hot French toast in the cinnamon-sugar and turn to coat completely. Divide the French toast among 4 serving plates. Top with a dollop of crème fraîche. Spoon the berry puree over the French toast. Scatter the fresh berries over and serve immediately. This entry was posted on August 19, 2010 at 7:02 am and is filed under Cooking, Family, Friends, People, Random, Recipe. You can follow any responses to this entry through the RSS 2.0 feed. You can leave a response, or trackback from your own site. Strawberries look delicious! I wanna eat now! Great recipe! Comfort food. It looks just delicious! Thanks for sharing. Delicious! I rarely have lazy mornings, but I love having breakfast for dinner. I think this would be lovely for that! 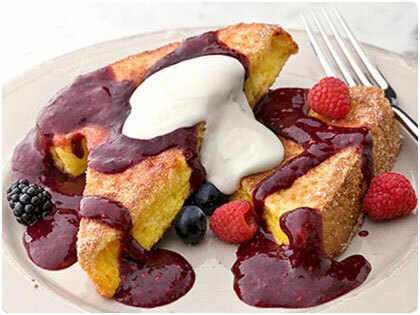 good idea to use a berry sauce instead of syrup…what wonderful colour!